No matter what stage of life you're in--college, recent graduate, mid-life crisis--we've all been at the point where we look at our bank account and cringe. One moment we thought we struck gold, and then overnight some goblins came in and snatched at you for all you're worth. Meanwhile everyone you know wants to be social (because, you know, life is social and all) and you're cowering indoors like a newfound homebody because you don't want to face the truth: the whole money situation is pretty rough. Believe it or not, you don't have to hand over your life savings every time you go on a date or spend quality time with family and friends. In fact, I am going to introduce you to five ideas for things to do for $20 or less in the Maryland area (You can adjust the Maryland suggestions to your own hometown). As Spring rolls right around the corner, it is the perfect time to act like an Annapolis tourist and stroll by the water and soak in some sunshine. Whether you're on a date or hanging with your friends, this day allows you to actually enjoy being with one another. I recommend finishing your Annapolis stroll with some Storm Bros. Ice Cream, which in my humble opinion is the best ice cream Annapolis has to offer. The catch? Storm Bros. only accepts cash - so make sure to hit the ATM before purchasing some creamy goodness. A single scoop is only $2.55, or you can be daring and get a whopping triple scoop for only $4.95 - still staying way under your allowance of $20. You can get a sneak peek of their popular flavors and other dessert options by visiting their website HERE. Yes ladies and gentlemen, it is time to bring out your inner child. This idea is perfect for a date because it allows you to unleash your playful side and not worry about the stiffness of the infamous dinner date. Head out to your nearest open field and try not to make a complete fool of yourself, though I can't promise that you won't look ridiculous. 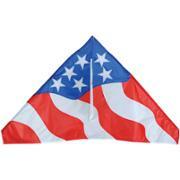 You can purchase the glorious kite above at Walmart for only $18. Not only are you staying below your $20 limit, you're making a bold patriotic statement as well. Kudos to you, you proud American. 3. Patapsco State Park + "Classy Picnic"
Maryland is home to a beautiful park named Patapsco. It has some great hiking trails for a variety of difficulty levels, so whether you want to go on a casual stroll or a strenuous adventure, you're set. I am amping up this hiking adventure with what I like to call a "classy picnic." Before you set off on your wilderness adventure, stop at your grocery store for a loaf of French bread, some cheese and wine. At Walmart, a loaf of French bread is only $1.00. You can get a fresh mozzarella ball from BelGioioso for $5.99. Finish your purchase off with a bottle of Fish Eye Pinot Grigio (which pairs very well with mozzarella) for only $11.50. Once you hike to a pretty spot, whip out your "classy picnic" and enjoy. Maybe you've lived in your town for a long time and never truly experienced it like an outsider or tourist would. This is your chance! Grab your friends or family and sightsee around a local hotspot, even stopping at various landmarks. Before you set out, pick up a disposable camera from a drugstore. The Kodak One-Time Use with Flash costs $7.99. Capture all of your day's memories and then drop the camera off to get them developed. This may seem like a ridiculous idea, but in the end you will have the best time goofing around. For all my scrapbookers: you'll getting a day's worth of scrapbook pictures. Although, I guarantee that somebody in your group will ruin at least 10 of those photos. You probably already know what I'm talking about: those big, five foot deep bins at Walmart overflowing with discounted movies that most people forgot even existed. They may slightly resemble death traps, and you may even be afraid that miniature clowns are hiding at the bottom. Fear not! These forgotten wonders are some of the best finds and will provide the entertainment for your day. I'm talking a MOVIE BINGE DAY! Buy 3 discounted movies from the Walmart movie bin at around $5 a piece. You can check out Walmart's website HERE to get a sneak preview of which movies are currently discounted. Then, buy some Pop Secret Movie Theater Butter Popcorn ($2.28 at Walmart) and a pack of Skittles ($2.55 at Dollar General). Now sit back and relax, because you've got the perfect movie day ahead of you. I hope these suggestions help you venture away from your cave of a home and towards quality time with the people you love. There are so many things you can do without breaking the bank, so get out there and try them! Or follow the example of Harry and Hermione and have an awkward dance party in your living room. Love these ideas! I have to try that picnic one in Central Park once it gets a bit warmer! Please leave me a comment, I love to read them!